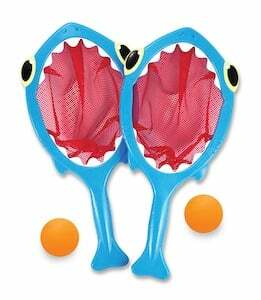 The Shark Toss & Catch Pool Toy - Melissa and Doug is an exciting pool game that comes with two nets, two foam balls and a challenge to make the optimal catch. These Melissa & Doug pool toys are designed with bright colors and a Spark Shark personality. These Melissa & Doug toys encourage hand/eye coordination, social skills, and plenty of outdoor activity. This toss and catch game will be plenty of fun for your kids and even includes ideas for further play. Each player holds one net and one ball, and floats/stands at the starting line inside the pool. Agree on a finish line, such as the opposite wall of the pool. On the count of three, both players drop the balls into the water, then use only the tail (handle) of the Spark Shark net to push the ball across the pool to the finish line. The first player whose ball touches the finish line wins!